IN JULY 1916 AN AMBITIOUS MUSICAL EVENT was promoted as Seattle’s “First Annual Music Festival.” A recently discovered promotional card reveals that the main musical attraction would be a performance of George Frederic Handel’s oratorio from “The Messiah.” A hand-penciled note at bottom states "Heard this in Arena, Seattle, July 23-1916" – but a bit more research will be required to determine what venue that actually was. 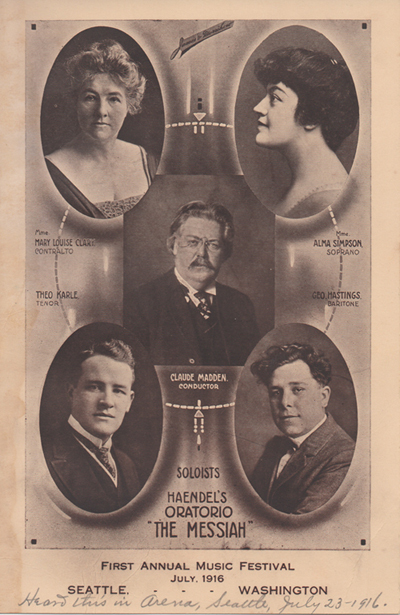 The festival orchestra’s conductor was none other than the town’s very prominent musician, Claude Madden – who also served the arts community in many other capacities including the Musical Director for the Amphion Society, and the President of both the Seattle Clef Club and the Seattle Composer’s Society. The concert’s soloists included some of the finest singing talents on the local scene including Mary Louise Clary – who was already singing in Seattle by 1902, the same year that the Musical Courier magazine described her as “a contralto of unusual power and fine quality.” Clary went on to record for Victor records in 1923, and tour widely with her own Clary Concert Company. Another, Seattle soprano Alma Simpson, went on to study in Europe and also tour South America several times. The Musical Monitor magazine once noted her as “an American prima donna” who drew large crowds to gigs at prestigious rooms including New York’s Metropolitan Opera House, the Town Hall, and Carnegie Hall. Seattle baritone George Hastings also went on to a career in New York, and later in 1916, Olympia’s famed tenor Theo Karle also went on to make his New York debut and recorded for Victor Records that same year, but cut his best-selling discs later for Brunswick Records between 1920 & 1924. Karle also toured with the New York Philharmonic Orchestra, sang concerts throughout Europe, and finally settled back home in the Northwest, finally passing away in Seattle in 1972. The practice of rock ‘n’ roll archaeology continuously accelerates as the decades race by. At this late date – and given the countless rock compilation albums that have been issued since the 1980s, & the growing number of albums that have been issued to represent many deservedly overlooked vintage bands – it comes as a supreme surprise to discover any group whose old music demands one’s full attention. Sweet Madness is perhaps the perfect example. 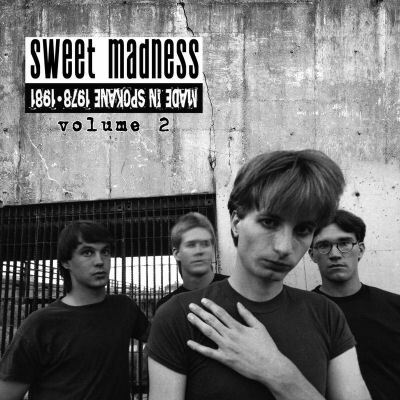 Formed in Spokane in 1978 – a time period when that town had zero cultural space for punk, New Wave, or anything musically interesting – Sweet Madness toiled in predictable obscurity without breaking through commercially in any measurable way. But as energetic and highly creative young men, the quartet focused admirably on their craft: writing impossibly catchy tunes, playing whatever gigs they could conjure, and – to our great luck – taking the initiative to cut plenty of their originals at numerous recording studios across the Northwest. In that pre-Grunge Era – when our local music biz infrastructure was still in its infancy – it was the extremely rare local band that managed to rise above the legions of other bands and achieve any notable success. To get a manager was a miracle. To actually cut a record was highly unlikely. To get that record on the radio was almost unprecedented. Many tried. Many failed. When the Heats’ “I Don’t Like Your Face” 45 became a minor “powerpop” hit on a handful of regional radio stations in 1980 all the scenesters took notice. Then, somehow, the Allies and Rail each saw their new music videos airing on MTV, and when the Young Fresh Fellows’ debut album was reviewed by Rolling Stone in 1984, that fact was the talk-of-the-town for weeks. In 1985 both the U-Men and Green River each signed to New York’s cool Homestead label and the excitement was palpable all across town…even though, the looming rise of Seattle’s Sub Pop label (and the all-conquering Grunge phenomena) were yet unknowable. Still, by that point in time it was just plain too late for some of the scene’s most promising early talents including Red Dress, the Blackouts, and the Visible Targets. So the vast majority of the era’s bands were destined to basically be forgotten footnotes in music history. Which is downright unjust. It is also why us fans of Northwest sounds were thrilled to death with the release, a couple years back, of Sweet Madness’ Made In Spokane 1978-1981 album – as distributed by Seattle’s mega-successful Light In The Attic label. The disc won rave reviews far and wide, which undoubtedly helped prompt the recent  release of the Made In Spokane 1978-1981 Volume 2 album. Both are chock full of delightfully quirky, but fully realized, rock tunes that might easily have remained locked away in the subterranean pop-memory vaults of only the band-members themselves and perhaps a few loyal fans. Instead, we can all now gaze back and play the mental game of: What If. What if Sweet Madness had managed to score a few more connections with Seattle’s fledgling music-oriented media? What if those young Spokeville rockers had gotten a shot at playing better gigs on the New Wave era dance-club scene? What if they’d signed a recording contract with a savvy label? What if kindred big-time outside bands – like, say, Split Enz, or Oingo Boingo, or Squeeze – had gotten the chance to hear them and maybe bring them along on tour? What if? What if? What if? Well, of course, now we’ll never know. 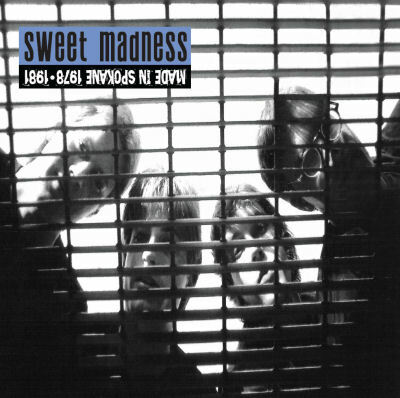 But with these Sweet Madness songs readily available I know that a lot of us somehow overlooked a terribly promising band, and it is simply everyone’s loss that we weren’t able to encourage them along their rightful path to greater success. Next time, as a creative community, let’s all be more vigilant & try and do a bit better, agreed? 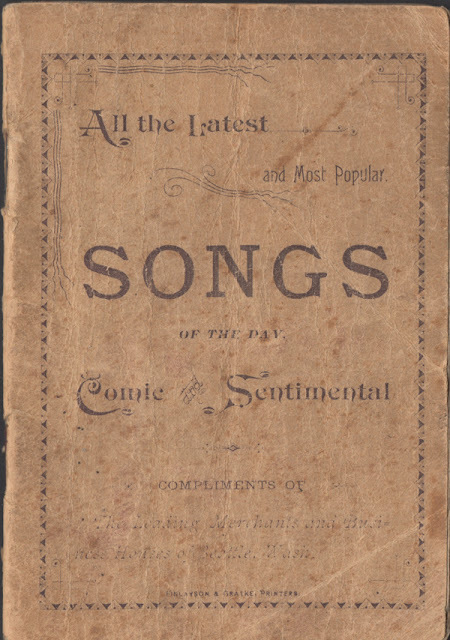 SONGS IN SHEET MUSIC FORM were being published in the Oregon Territories by at least the 1870s. Local musicians and songsmiths -- both professional and amateur -- would typically pay a local printing house to design some cover-art and then print a number of copies either for use onstage, or possibly to satisfy their personal vanity by seeing them available for sale at a local music shop, or even with the far-fetched goal of scoring a hit song. Their lyrical topics ranged from sentimental notions, to romantic thoughts, to regionally relevant ditties about the area's natural appeal. Notable examples over the decades include: Olympia's Francis Henry and his "The Old Settler" (1874); Bellingham's Alice Nadine Morrison and her "My Love Is All For You" (1920); and Seattle's Harold Weeks and his "Little Cabin in the Cascade Mountains" (1929). But, individual songs are one thing, while folios of multiple songs are a whole 'nother matter. They are far more scarce. 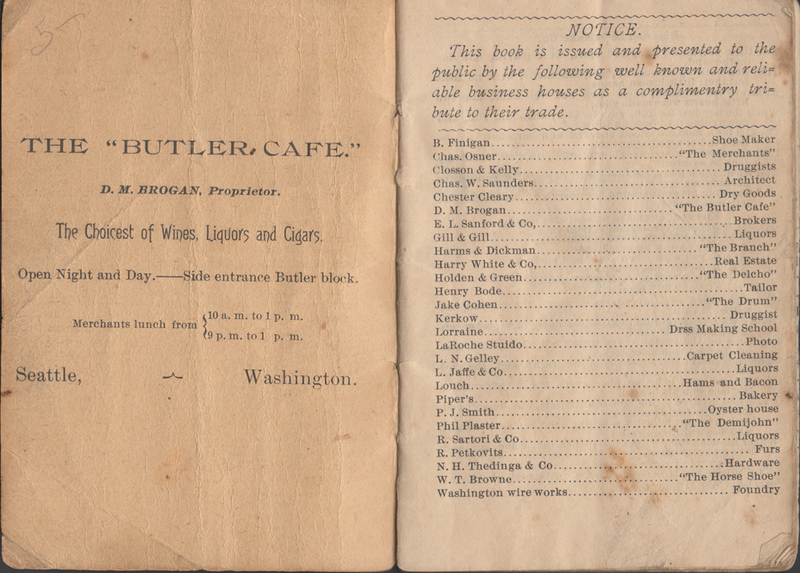 Seen here is what must be one of -- if not the -- earliest published booklet of songs that can be associated with Seattle. 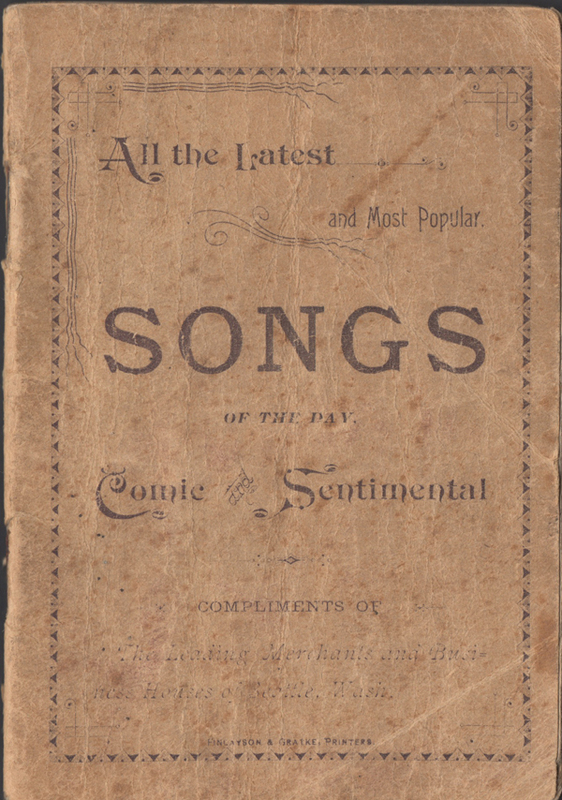 A recent eBay find, this (presumably circa 1890s) booklet is titled: All the Latest and Most Popular SONGS Of The Day - Comic and Sentimental - Compliments of The Leading Merchants and Business Houses of Seattle, Wash. The printing firm of Finlayson & Gratke may have been based down in Astoria, Oregon, but the advertisers credited in the 48-page booklet are strictly Seattle-based -- and, interestingly enough, are largely booze & smokes oriented. They include: The Merchants cigar shop (109 Yesler Avenue); Butler Cafe - The Choicest of Wines, Liquors and Cigars (Second Street & James Street); Gill & Gill liquors (806 Front Street); Delcho Beer, Wines, Liquors & Cigars (111 Yesler Street); The Demijohn Wines, Liquors and Cigars (910 Second Street); The Drum Fine Wines, Liquors and Cigars (812 Second Sttreet); L. Jaffe & Co. liquors; R. Satori & Co. Wines & Liquors (115 James Street); Harms & Dickman Wines Liquors & Cigars (corner Front Street & Marion Street); P.J. Smith's Oyster House (202 Yesler Street); and Seattle's fabled Horse Shoe tavern. A few of the 20+ songs included here are: "A Pretty Girl, A Summer Night," "Kiss and Let's Make Up" -- and the new technology-inspired "Telephone In De Air." However, the commercial genius behind a publication such as this one is that it only included the lyrics to each composition, rather than those and the musical notation required to actually play the songs at home on your parlor piano. Thus, at the bottom of each song's page is a helpful reminder that: "The music for this song can be obtained at O. E. Pettis & Co.'s Music house." As for who the authors of these songs might be, we may never know as this publication failed to bother to mention them!